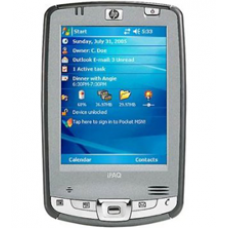 The versatile HP iPAQ hx2110 Pocket PC allows you to maximize Personal productivity through the use of Email, Calendar, and Contacts. It also comes equipped with Bluetooth wireless technology to allow you cable-free connections to other devices with Bluetooth technology such as printers or phones. HP ProtectTools secured by CREDANT Technologies, allows you to set a PIN or password to control access, and allows you to use industry-standard encryption to protect information stored on your device and your SD memory cards. * Intel PXA270 Processor 312 MHz and 128 MB total memory allowing you to store personal data more securely and helps protect it from device power loss. * Integrated Compact Flash Type II (CF) and Secure Digital (SD) slots for greater storage and expansion capabilities. * New automated backups through iPAQ Backup application. - Power: Removable rechargeable 920 mAh Lithium-Ion battery.